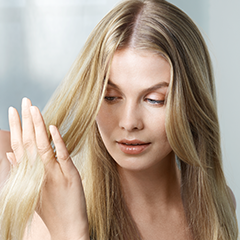 Regrowing hair is easy with ROGAINE® hair loss treatment for women; simply choose the hair regrowth formula that's best for you to grow thicker, fuller hair—both fit easily into your daily routine. "It's super easy to apply and doesn't leave a mess on your head! I would definitely recommend this product to anyone!" "Amazing. I never thought my hair could be this thick and full!"